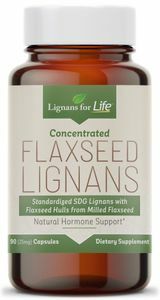 Lignans for Life Concentrated Flaxseed lignans (SDG) Lignans from Flaxseed Hulls For People or Dogs. 25 mg Capsules, Cold Milled Processed, Non-GMO, Gluten Free. Vegetarian capsules. 90 count bottle. 90 servings. Each capsule contains flaxseed hulls and standardized SDG lignans from flaxseed hulls to provide a consistent 25 mg of SDG lignans. 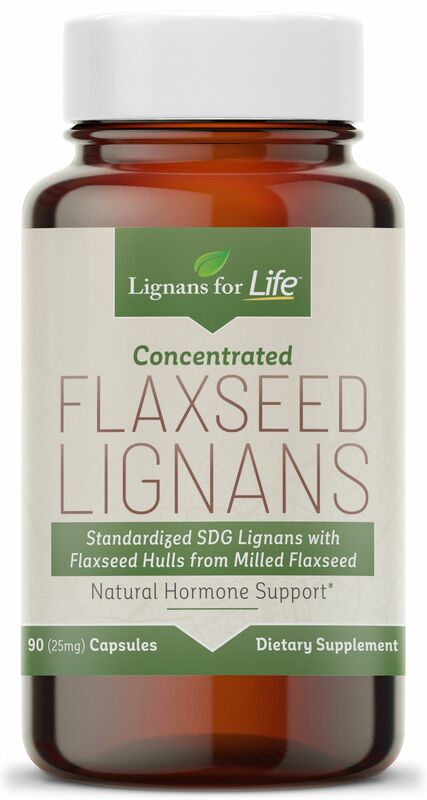 The flax hull powder is ground up and combined with a very highly concentrated SDG lignan extract from flaxseed. Each capsule contains 650 mg of flaxseed hulls and 25 mg of 40% standardized SDG extract for a total of 25 mg of SDG lignans. Many vets and universities recommend lignans for Cushings in dogs because lignans may reduce cortisol levels in dogs. Click here for more info on Cushing's in Dogs. For Dogs: Give 1-2 mg of lignan for each pound of body weight. Click the following link for more detailed info on Lignans Dosage for Dogs.